Toes curling into fine sand. The aquamarine blue waves of the Indian Ocean gently unfolding on the golden shore. A fresh coconut sipped in the shade of wind-whispering palms. A (not-too-long) bask in the morning or late afternoon sun. A cool-off in the vast expanse of sun-glittering sea. Some of the delights of a Sri Lankan beach. 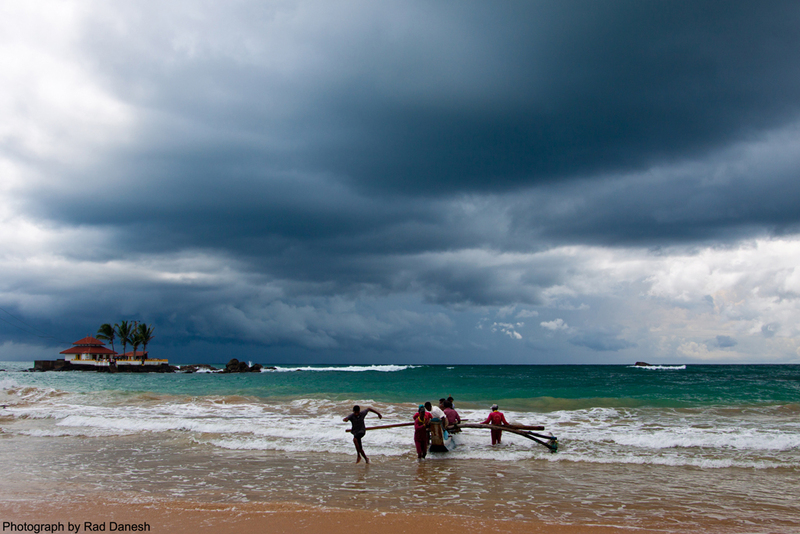 Where beaches are concerned you will be spoilt for choice in Sri Lanka. Beaches totaling 1,340Km fringe the island, from the long-established tourist destinations of the southern coast, to the vast beaches of the deep south, and the less-visited expanses of the north and east. No matter what time of the year, you can find a beach that is in season and just waiting to welcome you to its warm sands. Most visitors to Sri Lanka head to the beach destinations of the southern coast mostly situated south of Colombo. Each destination has developed its own distinctive character and highlights, and all are within easy reach of the capital. Let’s start with Negombo (37km from Colombo), situated only 6km from the Bandaranaike International Airport and therefore an excellent option for those on a short trip to the island or restricted to Colombo. The town has a long history of tourism and a wide beach, but also tempts the visitor with Dutch canal boat tours, a colourful fish market, and lively bars after dark. Equally convenient for those visiting the capital is Mount Lavinia beach – a mere 12km south of the city centre. The beach is a great place to stroll in the evenings and on holidays, and enjoy dining at one of the many and varied restaurants. Recently it has become a night-time destination for some of the most high profile parties in Colombo. Moving down the coast, the visitor leaves the urban sprawl and begins to scene the more relaxed nature of the south-west coast. Wadduwa (35km from Colombo) is a favourite weekend destination for many Colombo dwellers and features one of the most beautiful hotels on the coast. Kalutara (42km from Colombo) hosts a number of star-class hotels, another typically stunning beach, and also a majestic three-storey Buddhist temple, which has the world’s only hollow stupa. The road finally joins the coastline after crossing the railway tracks at Payagala and from this point onwards you are treated to a stunning drive overlooking cove after cove of pristine beach. Bentota (62km from Colombo) remains one of the most delightful beach resorts of this coast with large star-class hotels, exclusive boutiques, and even the delightful gardens of Bevis Bawa – brother of Sri Lanka’s most famous architect. On top of all this, Bentota boasts wide, picturesque beaches, and the Bentota Ganga (river) on which tourists can take a cruise inland or take part in water-sports. From Bentota onwards, beaches stretch before the visitor consistently Induruwa until finally we reach Hikkaduwa (98km from Colombo) – one of the most famous beach resorts in the island. Hikkaduwa is renowned for its diving and coral reef, as well as its surfing and nightlife.